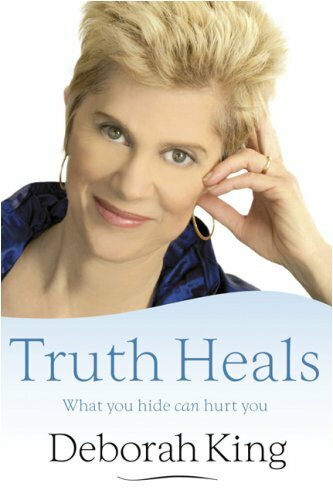 Truth Heals is Deborah King's astounding probe into the stark, naked,unadulterated truth - and its powerful impact on the life, death and thehealth issues and aberrations that happen in between. Through casehistories of her healing clients and the telling of her own remarkable story, Deborah illustrates how illness and disease can give way to a healthy, vibrant life. As a Presbyterian Pastor I am always looking for information that will help me as I deal with people and their issues. Deborah King's book is well written, based on personal experience and most helpful. As Jesus said, "you shall know the truth and the truth will set you free." In this book Deborah King, Ph.D explains how allowing yourself to acknowledge what is true can be liberating and healing. The book has seven chapters, one for each of the seven major chakras in the human energy system. In each chapter, specific emotional habits which can bring on physical problems are discussed. Simple checklists are included to help you identify any problems in that area of your own life and body and shows you how to help heal them. Ms. King uses client histories, celebrity profiles and her own experiences to demonstrate how anyone can release deep-seated layers of denial, fear and anger in order to heal the body. Truth Heals - what a concept! Deborah has created a good read. She combines her own painful past experiences growing up, with stories from celebrities to bring her points to the surface. I listened to Deborah King's seminar, then read the book. What a concept! Problems in your past - you need to bring them forward and meet them face to face. You will be surprised at the results within your own body when the stress and pain are released. A must read for those suffering from unfortunate pasts and current illness. Most people don't want to look very closely at their painful pasts. But they probably don't realize those memories are still hurting them physically. In Truth Heals, author Deborah King explores how these experiences affect our energy centers and shows us how we can reverse their effects. Focusing on each chakra (energy center), King shares some of her own childhood traumas and those of her clients. She explains how these might affect a person's health and emotional state today. Then she provides some thoughts on letting go in order to heal. The reader doesn't need to be familiar with chakras in order to benefit from this book. King explains what they are, along with the kinds of illnesses that manifest in each. She encourages those being treated for a specific illness to continue to work with their medical practitioners, while also integrating some emotional work to help the body let go of disease. Practical, helpful and uplifting, Truth Heals is a reminder that we are all that we put into our bodies - including our thoughts. Since we can change our thinking, we can also help reverse disease in our bodies. Anyone who wants to improve their health will find this book helpful in making positive changes. If you have been looking to establish the connection between your emotions, health, and inner truth --- look no further. This book is like having the blueprint of your emotions affect can affect your health. It helped me connect the dots between my emotions, energies, and health issues and guided me on exactly what I needed to do in order to have more vitality, health and happiness. I read this book cover to cover without moving as it is quite the page turner. Helped me specifically learn how to unlock some of my own limiting beliefs about my health.